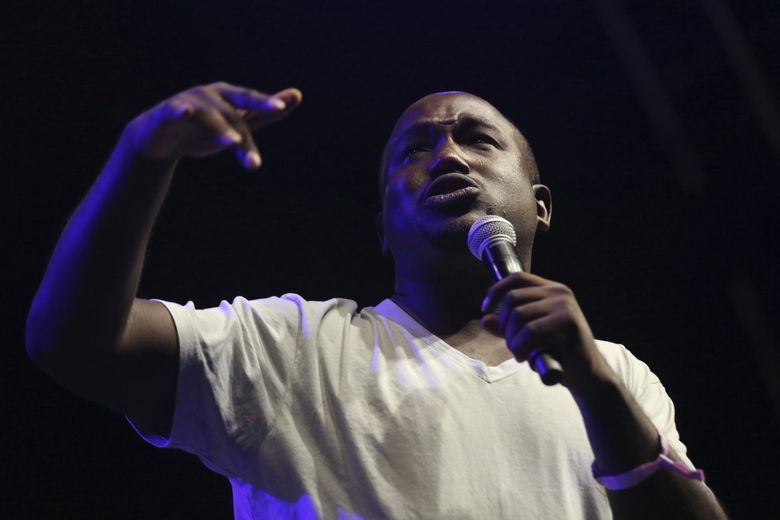 Comedian Hannibal Buress proves that you can be inhumanly productive without a morning routine. Bold words from someone who manages to juggle so many projects. In addition to stand-up — he’s headlining the Uncanny Comedy Festival at Kent’s accesso ShoWare Center on Saturday, March 23 — Buress co-hosted Adult Swim’s surreal talk show “The Eric Andre Show,” started a podcast called “Handsome Rambler,” played a kindhearted dentist on Comedy Central show “Broad City,” co-starred in the 2018 movie “Tag” and recorded some rap songs (including one called “Gibberish Rap” — hold onto that). He also gained some unwanted attention when his comments about Bill Cosby in a 2014 stand-up set went viral, reigniting sexual-assault allegations against the famous actor. But he doesn’t want to be known for that: In this interview, as in almost any with Buress, questions about Cosby were immediately shut down. It’s far from the most interesting thing about him, anyway. Here’s a little more about the real Hannibal Buress. What’s it like being an uncle? I go to my nephew’s hockey games — watching kids hockey is high-level entertainment. You have to respect kids hockey. I’ll see 11-year-old kids playing basketball, and even if they’re kind of good at 11, I still feel like I can take them, just based on size and strength alone. But 11-year-olds and hockey? I can’t do that. I can’t skate, that’s the first thing! I’d be terrible at hockey, right? Kids would destroy me. So I respect it. Do you follow any other sports? I like going to sporting events, basketball games. I like the Chicago Bulls. Seattle SuperSonics — that’s rough. No Sonics. No team. Any words of sympathy for us? Don’t worry, Seattle. Find your joy elsewhere. Go to a kids hockey game! It’s great — you can gamble. I gamble with the other uncles and aunts. But I try not to go higher than $5,000. Let’s just say, when I’m gambling on kids hockey, I need to get the people from Venmo to temporarily raise my limits. Was betting $5,000 on kids hockey how you knew you made it? I started betting $5,000 on kids hockey because this comedy [expletive] wasn’t paying off! Nah — one time, me and Tracy Morgan were in the same place, and I nodded, and he nodded, and I was like, there it is. Nonverbal. SLEEP MAAASK! I was in Hawaii for New Year’s at a gig, and on the way back I used a sleep mask. And then I was like, let me just try sleeping with a sleep mask at home. I felt refreshed. And I was happy about that. So I say, OK, if it’s good for sleeping, why not try it for the podcast? Obviously I like seeing stuff. LASIK has opened up my world. But do I need to see stuff all the time? Probably not. With the sleep mask, you’re cutting out distractions, and I think you speak with more clarity. I’ve also been freestyling with it, so I’m thinking of songs in my head and I’m really just trying to entertain myself. I’m not looking at somebody like, “Are you feeling this flow?” It doesn’t matter. I’m feeling this flow. You’ve gone over a year without drinking. What’s that been like? I look at old photos and it’s like, what the [expletive] was going on with my face? How is this face and that face the same face? It’s a drinking, puffy face! But it’s also helped me realize what I really enjoy, and it’s not being in bars. I’m like, OK, does this bar have video games? Some cards? Some Connect Four? You got movies going on? Is there a performance happening? Are we throwing something at something else? If it’s just a bar and noise, I got about 30 minutes in me, then I’m out. I’ve been trying to do more stuff that’s genuinely fun for me. If you could pursue any side project, what would it be? We talked about this on the podcast — I wanna do my own side business where we do gibberish weddings. I’ll officiate and go, [gibberish], they’ll kiss, and then that’s it. And I’ll charge $40,000 or $50,000 a wedding. Even if it’s two a year, and random weird rich people that do it, it’s more than worth the investment. We just gotta get the word out. Basically, Seattle: gibberish weddings. Let’s get some of that Amazon money.